Volodymyr Mosiienko was born on February 23, 1934 in Zinkiv village Poltava region in the fa­mily of the peasants. Upon graduating from the secondary school, he studied at the general medical department of O.O. Bogomolets Kyiv Medical Institute. As a qualified M.D., Dr. Mosiienko worked as a general practitioner for two years. Having heard the news that the research oncological institute was to set up in Kyiv, Dr. Mosiienko decided to take the path of studies in such a difficult and intriguing field. Dr. Mosiienko started his career of researcher as the postgraduate under the supervision of Prof. R.E. Kavetsky, the famous Ukrainian scientist. In 1965, Dr. Mosiienko defended his PhD thesis “Development of the method for pelvic perfusion and its use for the treatment of the experimental malignant tumors”. At that time, the regional perfusion was considered as one of the promising approaches for cancer thera­py. And later on, Dr. Mosiienko applied successfully the method of the regional perfusion in the clinics. Dr. Mosiienko has contributed much into the research in the field of pharmacodynamics and pharmacokinetics of anticancer drugs. The study of oxygen metabolism, the structured water, and blood microcirculation in the healthy and malignant tissues were among the fields of his scientific interests. He has developed the novel approaches for the use of antihypoxants, normo- and hypobaric hypoxia and cryogenic surgery aimed at increasing the efficacy of cancer treatment. In 1973, Dr. Mosiienko defended his doctoral thesis “Regional perfusion in the treatment of malignancies (experimental-and-clinical study)”. Academician R.E. Kavetsky was the research adviser of both his PhD and doctoral theses. Dr. Mosiienko devoted considerable efforts to elucidate the role of oxygen and free radicals in the development of tumor. In particular, he studied the effects of the increased or decreased oxygen pressure on tumor growth. Dr. Mosiienko explored how to use the reactive oxygen species both alone and in complex with cytostatics for cancer treatment. He suggested that the hypoxic state of the tissues in tumor-bearing host represents the adaptive response contributing to increasing survival of cancer patients. Therefore, contrary to the wide-spread belief that hypoxic treatment is much like “drive out fire with fire”, Dr. Mosiienko put forward the idea that hypoxic treatment in fact should be considered as the placement of the host into more adequate setting approaching the patient to the “physiological rest state” sparing the energy resources and deteriorating the environment for tumor cell growth. In recent years, Dr. Mosiienko became enthusiastic in developing the novel research area — study of nanoparticles as the probable innovative approach for cancer treatment. He obtained important results in experiments with silicon oxide nanoparticles and fullerenes suggesting the original approaches in the­rapy of cancer patients. 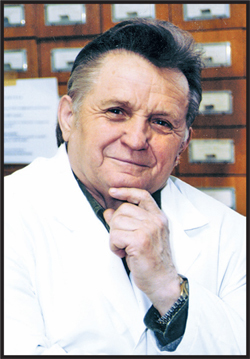 Dr. Mosiienko is coauthor of the development of the domestic immunomodulator Blasten. The drug is regis­tered in Ukraine and applied in the clinical settings. Dr. Mosiienko also was engaged in the studies aimed at improving the efficacy of anticancer vaccines. Dr. Mosiienko authored more than 200 scientific papers and 4 monographs. He has 10 patents for his inventions. He supervised seven completed PhD theses. In his last monographs “Integral Approach towards Therapy of Neoplastic Diseases” (2009) and “Cancer: Path into Unknown, Disappointments and Hopes” (2010), Dr. Mosiienko attempted to consider cancer problem in the light of the complex interrelationships in the “host — tumor — environment” triad. In this view, the author suggested and substantiated the novel approach to cancer treatment that he called as integral (adaptive) therapy. Unfortunately, the untimely death prevented him from finishing these studies. Dr. Mosiienko was generous and modest responding to the needs of others. The bright memory of Volodymyr Serhiiovych Mosiienko will live forever in the hearts of all who knew him.